We're excited for the upcoming 9th annual storytelling festival - Art of the Story. There are some great performers coming to Washington County April 13th to 20th. We want to highlight all of the storytellers in turn, and next up is Bill Ratner. Bill is one of Hollywood's premier voices and storytellers. For those of you who watched G.I. Joe, Bill was the voice of Flint. You'll also recognize his voice from many movie trailers and commercials. 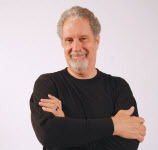 In addition to his successful career in voiceovers, Bill is a master storyteller - National Storytelling Festival Slam Teller, Best of Hollywood Fringe Festival, eight-time Moth StorySLAM Winner - as well as a published short story writer, essayist, and playwright. He performs his stories in comedy clubs, theaters, taverns, schools, and storytelling festivals across the country. Want to see Bill in action? Check out this video of a performance on the Comedy Central Stage in Hollywood. This performance is for adults, and contains a few "colorful" situations. It's a charming and funny story from the days of his father and uncle, growing up in 1920s Chicago.